Today, I am going to make a Text Editor program using our Java. Yeah, Like notepad. 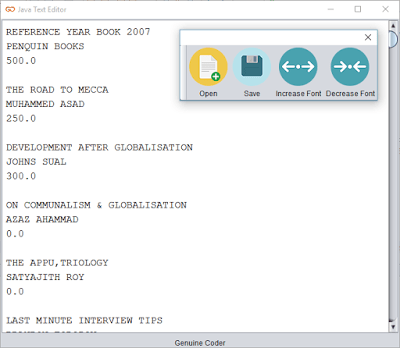 I want to add some basic functionalities like Opening a file, Saving a file and option to change the font size. It will only take less than 100 lines of code to do this (Excluding User Interface). I started with the toolbar javax.swing.JToolBar and added 4 buttons. Button with simple label logo and text for open,save and font size changing. 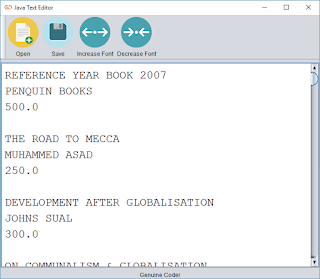 The display area is simply a JTextArea with monotype font. When the user selects a file and click open, The Scanner from java.util.Scanner is used to read the file. 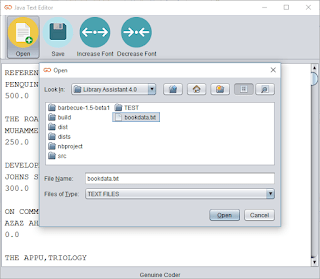 The “file” is nothing but the file taken from the JFileChooser and the while loop will continue until the end of file. “display” is the name of JTextArea, our display. A global file variable called “currentEditingFile” is maintained to know whether we are working on a new, unsaved data or on an opened file. If “currentEditingFile” is null we have a new uncreated file. So the saving method will look to “currentEditingFile” and if it is null a JFileChooser will be opened to select the location for the new file. After selecting the directory, file name is taken from JOptionPane input dialog. The file is then written onto the file Using PrintWriter from java.io.PrintWriter. 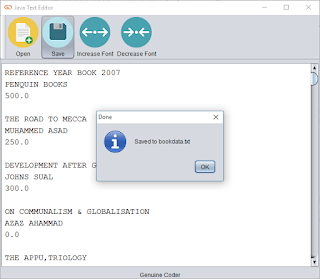 A global variable with default font size as 14 is maintained and increased or decreased depending upon the button pressed. super.windowClosing(e); //To change body of generated methods, choose Tools | Templates. So that’s it. Download the program / source code from below buttons. If this was helpful please like me on facebook and keep visiting for more cool programs and sources.